It's hard to believe KBR is five years old because it feels much, much older to me. I guess because my obsession with children's books, particularly picture books, has been in full flight for well over 30 years now. It runs so deep, I honestly wonder if I've ever grown up. 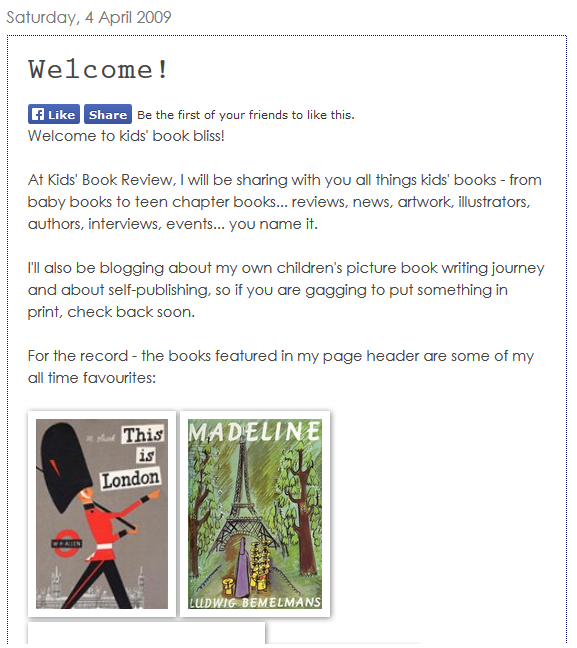 On 4 April, 2009, I started Kids' Book Review as a personal little blog, to satisfy that picture book obsession. I wanted to write reviews and write about great covers and cool illustrations, and all manner of anything bookish. You'll see my very first post, above. Now, five years later, I look at the front page of the site. I scroll down and run my eyes over all the buttons and links and it's truly mind-boggling to realise the rich and varied content that lies beneath each link. I am humbled, grateful and overwhelmed at the participation and the contributions from so many talented, giving, book-loving people, who have built KBR into what it is today. And what it is today, is the Number One Children's Book Review Site on the web. We have well over 2000 reviews and endless guest posts, news items, interviews, events and resources for anyone even vaguely interested in the children's book industry. We have reviewed books from all corners of the globe, in varying genre, from majors, indies and self-publishers, all with the desire to share wonderful books, and espouse and promote both juvenile literacy and the magic of books and their importance in the life of a child. For me--this is what KBR is all about. Our Unpublished Picture Book Manuscript Award (now in its fourth year and also now incorporating an Illustration section) has become a force of its own, and we have been wholeheartedly supporting book creators for many years now--both through exposure on the site, and also in regard to writing resources. We even have our own newsletter now, which comes out 10 times a year. We have also supported charity events, including the Indigenous Literacy Foundation, and for our birthday month, will be running Creating a Welcome, a Children's Book and Art Sale to raise funds for the Asylum Seeker Resource Centre, because creative people have good brains and hearts, and this is what people with good brains and hearts do. What the future holds for KBR, I do not know, but the site has become like a child to me and I love it dearly. I have formed the most glorious relationships and friendships through the site, and I will treasure them always. Each and every contributor to KBR has been such a valued member, and has absolutely shaped the site and what it is today. I want to make particular mention of past KBR-shapers Megan Blandford and Kelly Morton, and KBR's current Managing Editor Susan Whelan, for their incredible dedication, tireless efforts and supreme talent. This site would not be what it is today without you. The current KBR team also includes Anouska Jones, Jo Burnell, Sarah Steed and regular contributor Anastasia Gonis. The ideas, content and friendship they have shown me and KBR is just beyond. I know I speak for every KBR contributor when I say that being part of this site feels incredibly indulgent. Being able to write about books and come up with creative ideas is pure joy and is never a chore. I feel so very blessed to share that passion with my KBR crew and I hope you have loved, and are continuing to love, everything this site represents. So, thank you, team, and thank you to all our gorgeous readers who have absolutely contributed to who KBR is today. I am slicing up the virtual cake and raising my glass. Here's to books and their power to change children's lives for the better.